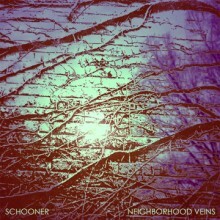 Indie rock band Schooner has announced they will be releasing a new album entitled Neighborhood Veins on September 24th. The release comes nearly six years after their last release, with a new revamped lineup. The band premiered “It Won’t Matter” via Consequence of Sound Friday, and you can also stream the track below. Check below for additional details as well as a list of fall tour dates. It’s been a long time coming for Durham, NC’s Schooner’s Neighborhood Veins, the first national release by the Chapel Hill/Durham boutique limited release vinyl-cassette-art project PotLuck label. The band, long treating fans to their erratic indie- pop-psych-soul gems, nearly broke up just after releasing 2007’s Hold on Too Tight. Reid Johnson, who founded the group based on a 4-track recording project, took time off to re-evaluate his motivation for playing music. Members broke up & moved away. The rest of the band got day jobs. A different lineup came back for 2010’s Duck Kee Sessions and things looked again like they were moving at a steady pace, with the band travelling to SXSW and being named one of PASTE Magazine’s “Best of What’s Next.” Upon the start of recording Neighborhood Veins, however, the band changed lineups again. With none of the founding members remaining Johnson persevered with Maria Albani, Joshua Carpenter (Floating Action), and Chris Badger as the band on Veins, and received a generous amount of help from NC artists. The collaborative and enthusiastic effort of friends and talented artists such as Ivan Howard (The Rosebuds/GAYNGS), Phil Moore (Bowerbirds), Bob “Crowmeat” Pence (Dexter Romweber, D-Town Brass), Jeff Crawford (The Old Ceremony, Roman Candle), and a slew of other important members of the NC music community led to the appropriately named Neighborhood Veins. This group of songs is a more energetic endeavor for Schooner– like the band had pent up all of its potential energy into one effort. The opener, “It Won’t Matter,” breaks out from a spooky whistle in the background of an acoustic strum into a full throttle ramble with fuzz bass and a specter-like men’s choir in the background. “Trap” starts with a Modern Lovers-esque intro before jolting into a caffeine-fueled carnival romp. Even “Still in Love,” which recalls a 50s doo-wop number, and “Say My Name,” with its sepia-toned folk contemplation, deconstruct as a trip into a restless, erratic mind. Captivating and engaging as these melodic compositions are, the songs truly come alive through what has been a consistent strength of Schooner–the transporting nature of the lyrics. Throughout the most blue-eyed sounding tunes, there always seems to be a sense of melancholy and searching that underlines the overall tone of the work. “Floodlights and Ghosts” moves through a backbeat of almost trip-hop textures, longing for a loved one that has moved away while using the imagery of a flooded wasteland. “Big Mistake” takes the listener on a group-sing-shanty of a seemingly upbeat “so what if I make a big mistake,” but lines like “and you can do nothing great, for you’re here too late” underscore Johnson’s tendency to juxtapose both cynics and romantics alike. Neighborhood Veins at its essence is an exciting collection of mindful earworms–keep a sharp wit, else the intimate joys slip through your fingers.